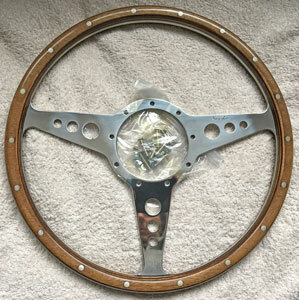 Still too cold to work in the garage (-1 at the moment) but I took advantage of Rimmer's sale by treating myself to a couple of items: a new wiper motor and a Moto-Lita steering wheel! 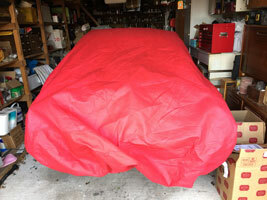 Now warmed up to 8 degrees, so uncovered car and tried to start it. However failed, and found that the fuel system was bone dry - all the petrol must have leaked from the rear join (see 19th November). 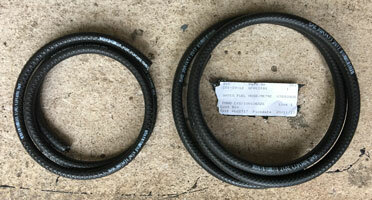 I then went to replace the fuel hoses with the Gates Barricade, ethanol proof ones. However I found I had ordered the wrong sizes, 3/16" and 1/4" instead of 1/4" and 5/16" back last November, so I've ordered some more from Moss Europe. Fitted the new Gates ethanol proof petrol pipes to rear and either side of the fuel filter below the fuel pump. Filled the fuel tank with the best Esso Synergy Unleaded Petrol, and tried to start the engine. No fuel leaks this time! 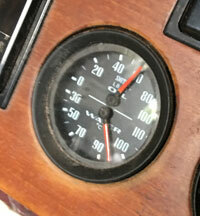 Started, but couldn't maintain revs so I suspected that the carburettor pistons were sticking. I then freed up the carb pistons by pressing the lifting pin underneath a few times. It now started properly, so I ran the engine for a few minutes - it's the first time I've had the engine running since 4th November last year! 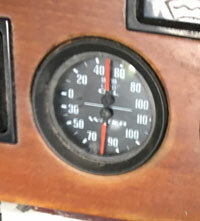 Oil pressure was good (60psi see below), but I had two concerns: (1) the engine was vibrating at the front (this could be clearly heard). Either the new water pump is vibrating or the new fan is! (2) the water temperature went up to 95 degrees and rising, much hotter than the usual 80 degrees. 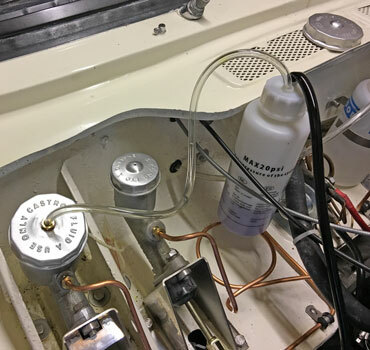 Later, when I took off the radiator cap the water level seemed low (probable air locks), so at a future date I'll top up the system and try again. Bought some more Halfords Silicate Anti-Freeze and Coolant (ready mixed) and topped up the radiator - it took at least another litre, presumably there were air locks. Started up car again and ran for 20 minutes. This time the temperature stabilised at 80 degrees (see below). 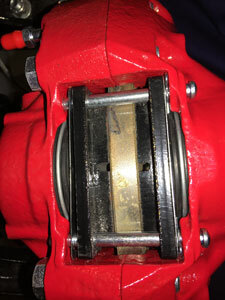 I also emailed Chris Witor about the water pump as a slo-mo video taken on my mobile phone clearly shows a wobble (I bought it new from them last year). 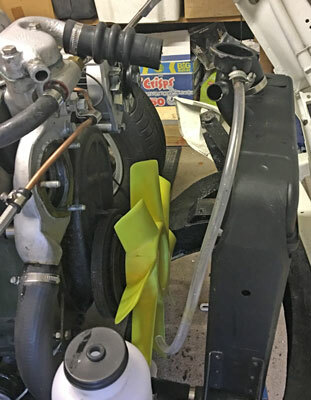 Had a response from Chris Witor: "Try running the engine briefly with the belt removed to see if the vibration goes away". I did this, this afternoon, and there was no vibration at all, so I told Chris via email and am awaiting his response. P.S. Just had a reply: "Best return that one for replacement. We will Cover £7.50 of the return shipping cost. 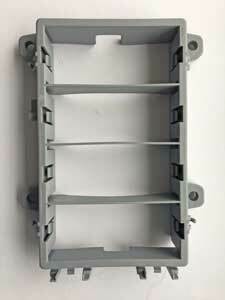 If you need one in a hurry, best pace a new order, we can refund when we receive the faulty unit". I duly ordered another one which I'll fit at the same time as removing the faulty one. 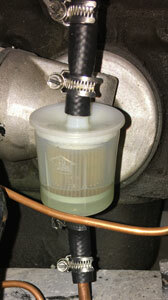 New water pump duly arrived from Chris Witor, with the pulley sheared off the pump (see below)! Poorly packed, I've emailed Chris asking for a full refund. I'll either buy another from James Paddock (collection), get the old one refurbished, or get an alloy one. Comments from Chris "Sorry to see the pump was broken in transit. I have sent out maybe 200 pumps and that's the first to get damaged in transit. Most are wrapped less well than this just being within a bubble wrap bag within an express pack bag. It must have been dropped from a height or thrown around in transit. I will put in a claim. By all means get one form another supplier, but you may find it is of the same origin. Failure of these pumps has been around 1% which is pretty good. 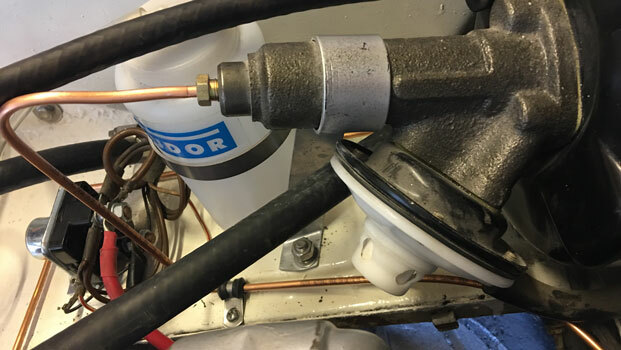 In the past we supplied Unipart pumps which all leaked within 500 miles... " The make was County Motor Factors, and it was marked "Made in India". I emailed Paddocks and they say theirs is the same make, so I'll probably get one from them, at least I can collect it! Removed the wobbly water pump, I'll send both back to Chris Witor tomorrow for a refund. In the wobbly one, the bearing has quite a bit of play, no wonder it wobbled! Fitted two stainless P brackets to secure rear fuel pipe to the chassis. Finally fitted the new water pump, hopefully this time without the 'wobble' (it's the same make). I got this from James Paddock yesterday, only £36. 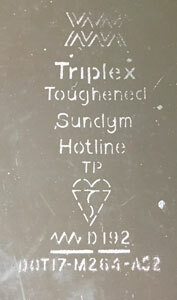 It is made by County Motor Vehicle Components (see detail from the box it came in below). Ignore the "England", it is made in India. 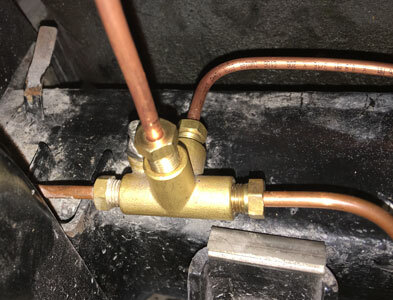 According to Chris Witor, failure of these pumps has been around 1% which is pretty good". 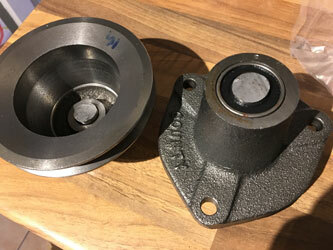 I was considering having the old water pump reconditioned, Tim Goldthorp of Classic Quality Parts Ltd would have done it for £80. 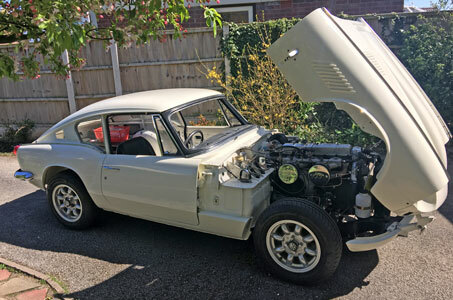 He specialises in Jaguar components but with the GT6 the pump would be stripped down, shot blasted, new bearings and seals fitted and rebuilt. They use ceramic warfare seals which last far longer than any original seal and make the pump work more efficiently. Unfortunately I couldn't find the old water pump, so opted for the new replacement. Typically I found it later! I ran the engine for around 10/15 minutes and this time no untoward vibration from the water pump. I also made and fitted the short brake pipe from the rear n/s wheel cylinder to the bracket holding the flexible pipe. Not easy, my first effort had to be thrown away! 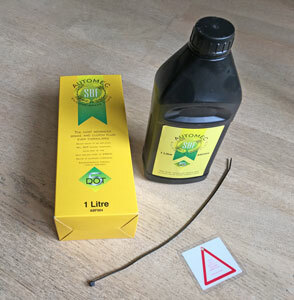 Also, the one supplied in the Automec kit was far too long, so I did the right thing buying the brake pipe flaring tool! 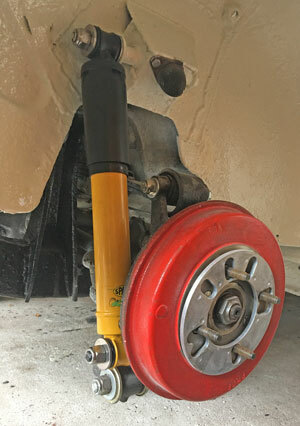 Fitted o/s rear shock absorber, rear o/s flexible brake pipe and connected the brake pipe running under the car from the n/s brakes to this o/s flexible, see below. 1. 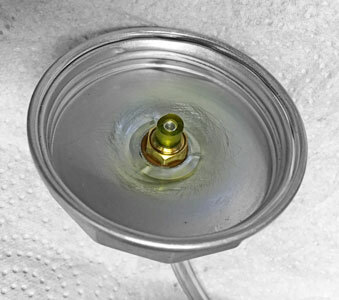 Cleaning the thread of the upper shock absorber link with die (to remove paint). 2. New shock absorber (Spax adjustable) in position with new stainless nuts and washers. 3. 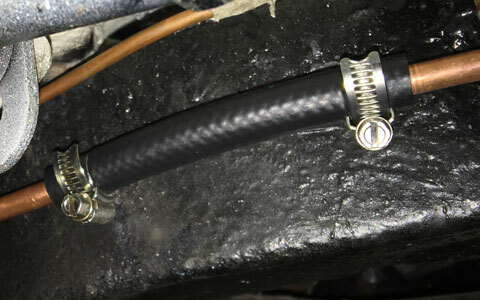 Brake pipe connections (o/s). 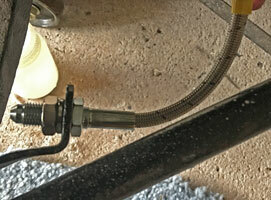 Next job, the brake pipe from the rear o/s brake cylinder to the flexible (see above right picture). Not a successful day! 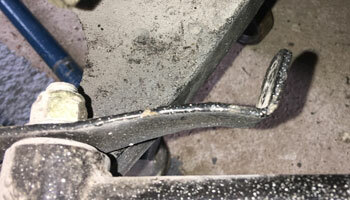 Tried to make, shape and fit the rear o/s brake pipe from the flexible (above) to the wheel cylinder. 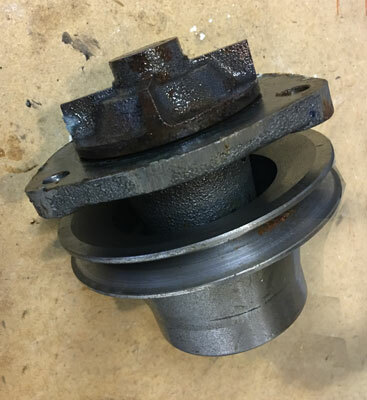 First, the bracket mounted on the hub was bent, so this had to be straightened (see before & after below). Then, two attempts to make the pipe failed - this is not easy at all with no original to copy or photograph in the workshop manual. In the middle of the third (and hopefully last) attempt I had to take the dog for her afternoon walk and afterwards failing light and cold conditions (6 degrees) discouraged me from continueing. 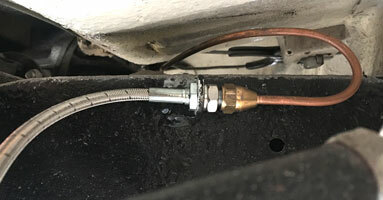 Continued on the next day by completing the brake pipe, in spite of foul weather. Care was needed to clear the driveshaft and the rotoflex coupling (see above)! It was a lovely day, and Neville & Pat had returned from their stay with us, so I took the car out of the garage for the first time since March 2017! I drove it up and down my drive, checking that all gears worked i.e. 1st, 2nd, 3rd and 4th (as well as reverse! ), which they did. I took advantage of the empty garage to give the floor a good clean. 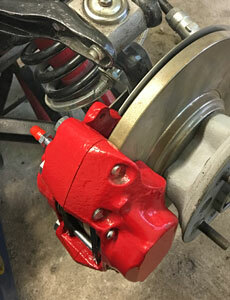 Next, I started to prepare for my next job, the fitting of the front disk brake calipers (rebuilt by BiggRed). 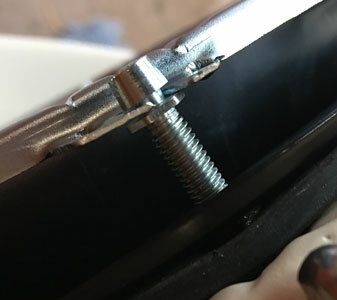 As I was fitting the special MINTEX disk pads to a car using Type16P Imperial calipers, the pad pin holes needed to be drilled out to 1/4" diameter to suit the larger pad pins. 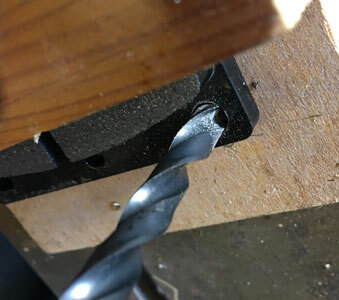 I did this on the pillar drill (which is more accessible when the car is out of the garage), although I found that 0.25" was insufficient so did it with a 7mm drill (0.275"), see below. 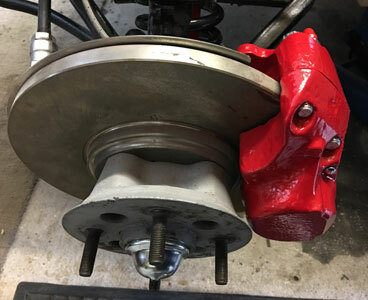 Jacked up the car and removed the front o/s wheel to fit the front brake caliper, together with the brake lines (flexible and copper). On rotation the disk caught slightly on the caliper, so I adjusted the tapered hub bearings as they were a bit slack, and now it spins without catching. Had trouble making a suitable brake pipe to go from the bracket attached with the top caliper bolt, so left this for another day! 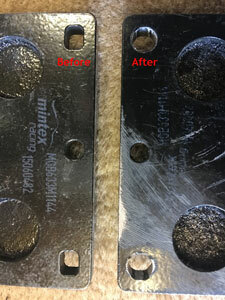 Fitted the Mintex pads with the anti-squeal shims. 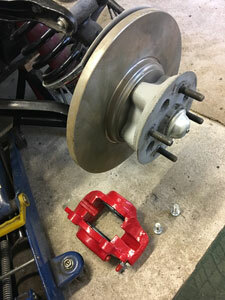 Finally made and fitted the brake pipe from the bracket to the o/s front caliper, see below. Regreased the bearing and fitted a new split pin and grease cap, refitted the wheel and lowered the car to the ground. Next job, the n/s. Done the same as above on the n/s. 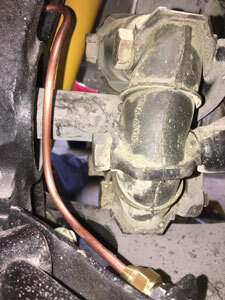 Managed to get the brake pipe right first time, practise makes perfect! 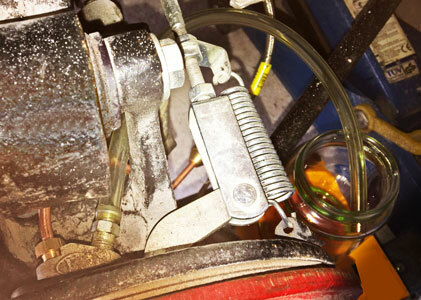 Fabricated and fitted the brake pipe from the master cylinder to the brake servo. I had to disconnect the clutch pipe, but hadn't been happy with it in any case, it was too long! 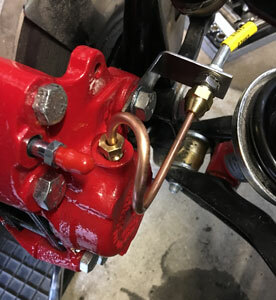 Finally finished fabricating and fitting the new clutch pipe from the master cylinder to the slave cylinder on the third attempt! Finished the last two brake pipes, not a walk in the park at all! The pipe (above left) goes from the 4-way union on the n/s chassis member (above right) to the brake servo. This pipe was discarded as it went wrong (see kinked pipe top right as I bent it in the wrong direction!). 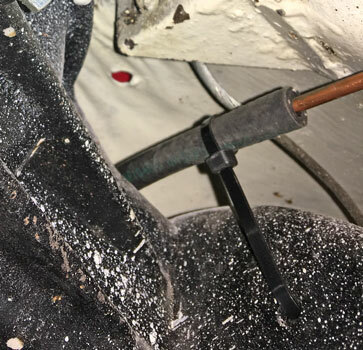 This copper pipe bends very easily but does not like being bent back or in the opposite direction as it hardens (case hardening?). 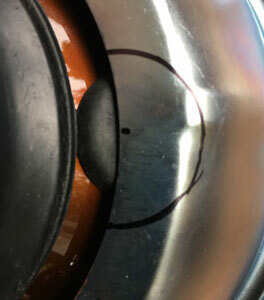 Therefore, when I made a mistake in the direction of a bend (easy to do off the car with a bending tool), I had to thow it away and start again. I eventually got it right (see below). 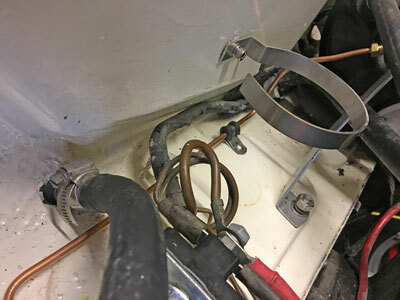 I try to route the pipes neatly and don't follow the most direct route, clipping where possible with stainless steel P clips. 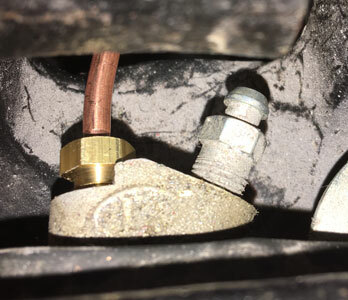 Below is the pipe from the front n/s bracket near the brake caliper, to th 4-way union, with which I succeeded first time! I was worried about the brake pipe running over the rear axle, as it was quite long (around 3 ft) and only secured at each end. 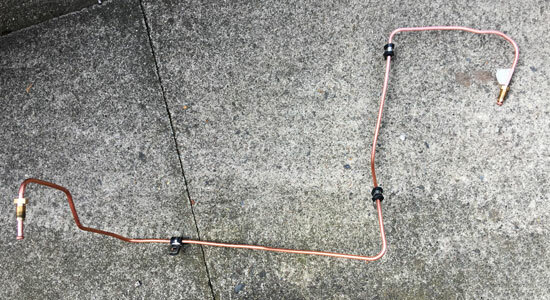 I have heard that unsecured copper pipes can suffer fatigue fractures if they vibrate unduly. In the end I slipped a short length (around 1 ft) of rubber fuel pipe over the brake pipe wher it goes over the rear differential and secured each end of this to each side of the rear differential carrier with plastic ties (using a convenient hole), see below. Next, bleeding the clutch and brakes. A while since my last time on the car, as we spent a few very enjoyable days in Prague! Re bled the clutch, using my Gunson Eezibleed Kit. 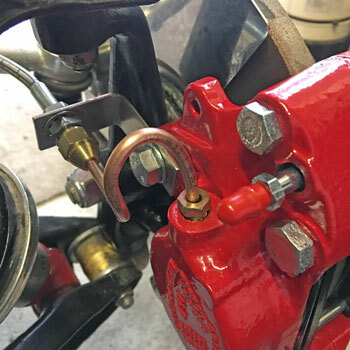 Then I tried to start doing the brakes, but found that the kit contained no caps large enough to fit on the brake master cylinder. 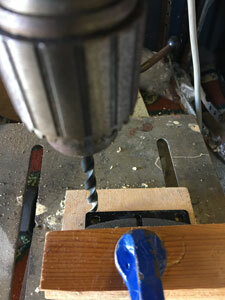 I decided to buy a new cap (from trusty James Paddocks) and flatten the old one and drill a 9.5mm hole so the Eezibleed pipe will fit (see below in action). Just because I can, I "taxed" the car today, as from today cars over 40 year's old no longer need an MoT (it is already insured). When it is finally roadworthy and I take it out onto the road, I will get it MoT'd (or an equivalent mechanical check). A bad day! I carefully bled the brakes, starting with the furthest from the master cylinder and ending with the nearest. I then tried the brake pedal. It just went down to the floor, so I pumped it a few times to no avail. I then got out of the car and I then noticed a large pool of brake fluid under the car! On further checking I found that the union joining the two front to rear brake lines in the middle of the car was the culprit. One end was tight, but the other was only finger tight, hence the £30 worth of fluid on the floor. 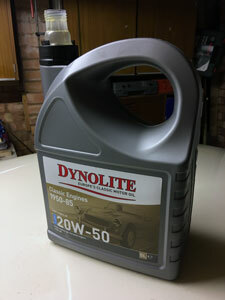 I tightened this, and will try again, when I've bought another litre of DOT5 fluid from James Paddocks. Finally bled the brakes, having purchased more fluid yesterday, with no losses! Next job is to get the car out of the garage and test them. I suspect another bleed may be necessary, as the pedal tightens up after one pump, but this may be the servo. Drove the car out of the garage today! 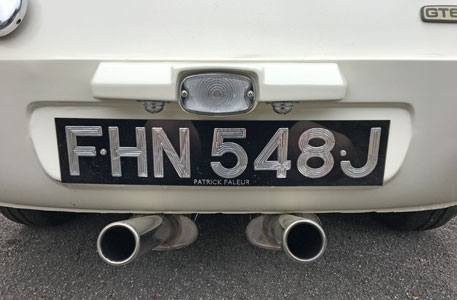 To confirm the car's identity (now it's "taxed") I fitted the rear number plate. The brakes work, but an extra pump on the pedal inproves them! 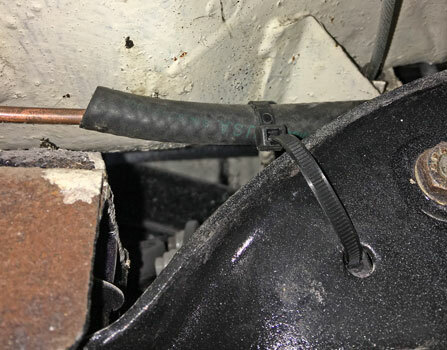 I'll have to try the recommendation in the Lockheed servo installation instructions to "crack open" the brake pipe tube nut at the servo outlet connection whilst depressing the brake pedal. 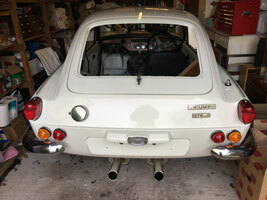 I did some work on the inside rear of the car, installing the (original) spare tyre and the fuel tank board. The spare needs the tyre removing, the wheel refurbishing, and a new tyre fitting. 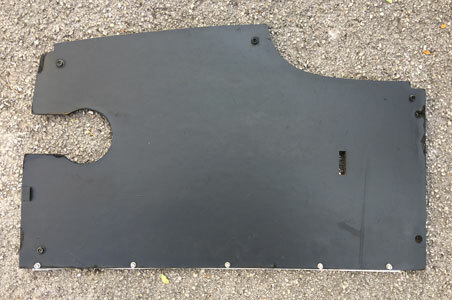 The spare wheel board needs some minor fettling to get it to fit properly (it's not the original) and painting black to match the original left hand board. 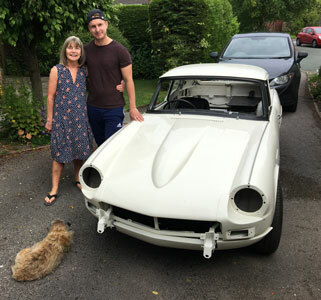 Below right is the car with my wife Liz, my son Jason and Cleo our Border Terrior who has a talent for appearing in photos! It's strange to think that I wasn't much older than my son when I bought the car (he's 29, I was 31). 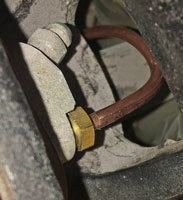 Drove the car out of the garage and "cracked open" the brake pipe (see Saturday's blog). Brakes are reasonably effective at low speeds, but still require a second pump for the pedal to become hard. I'll have to bleed them again at the wheels. Then I turned my attention to the rear boards. 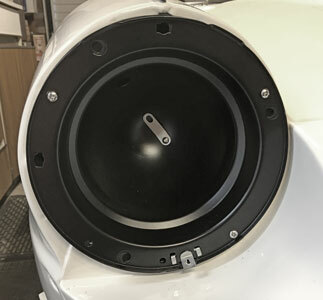 I repainted the fuel tank board (matt black) and re-attached the metal strip at the right hand edge (to locate the left hand edge of the spare wheel board) with stainless fasteners. I also got some of the interior trim from the cupboard in the garage, and cleaned it up! 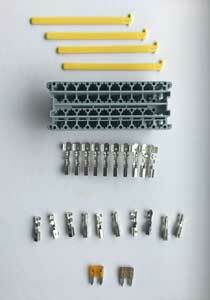 Started thinking about the front wiring loom which I intend to remake from scratch! 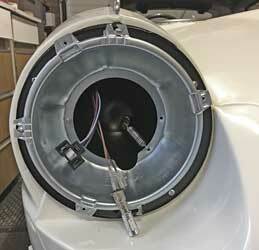 Started by removing the ignition starter switch (Lucas 47SA). I was a bit puzzled, as the wiring diagram didn't match the numbers on the switch. 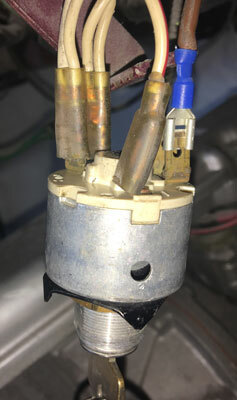 I attached a meter, and the 2 double terminals 1 and 2 are connected when the ignition is switched on, and the single terminal 3 becomes live when the key is turned further against a spring. Looking at the second picture the brown wire is the live feed (from the battery via the solenoid) and the 4 white wires go to the various components. When the ignition is switched on the live feed is connected to the white wires. When it is turned further the white/red wire which goes to the solenoid becomes live and the starter is activated. However if the first picture is examined terminal 1 has a "2" near it, terminal 2 has a "3" near it and terminal 3 has a "1" near it!!! 1. Ignition warning light & alternator. 2. 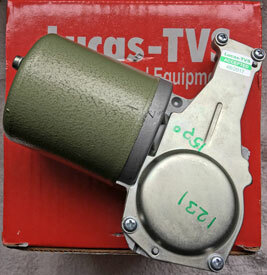 Ignition coil & distributor. 3. Oil pressure warning light & switch. 4. Circuits protected by the top fuse (heated rear window; indicators; heater; fuel/temperature gauges; brake lights; wipers; reversing light). 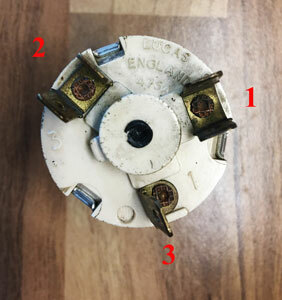 The middle and lower fuses control the parking & number plate lamps, the horn, the hazard lights, the headlamp flasher and the interior light and are permanently live (i.e. can be used without the ignition being turned on). 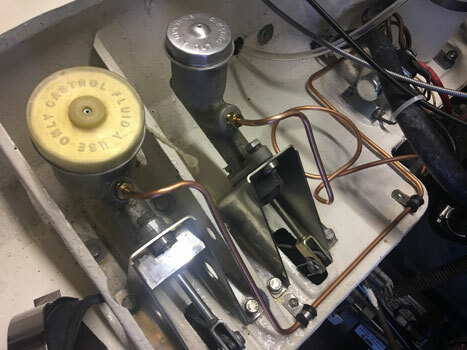 The aim, therefore is to replace the 3 fuses with possibly 12, one for each circuit using a new fuse box mounted in the passenger compartment. Currently the only relay is for the horn. I intend to add relays for the head lamps, and possibly the heated rear window which draws a lot of current. As the overdrive is J-Type, it doesn't need a relay as the current drawn is low. Did an oil and filter change, as this hasn't been done since 2013. 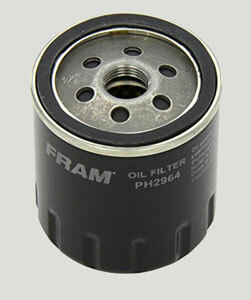 Used a 'quality' oil (Dynolite 20/50 from Paddocks) and the Fram PH2964 filter supplied to fit the Spin-Off Oil Filter Conversion Kit . As I aways do, I removed the spark plugs and spun the engine with the starter until the oil pressure gauge showed pressure. I prefer to do this, as I don't think it's a good idea to run the engine under load, until the new oil is circulating. I cleaned up the Lucas front indicator/sidelight assemblies, and fitted them. 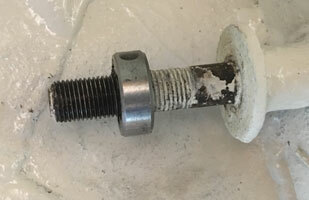 They are supposed to be attached with FZ34044 nut retainers, but I prefer to use stainless steel nuts and washers. Which fiitted the threads of the captive studs? M5! Did most of todays work working on designing the new front wiring loom. 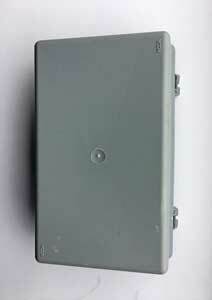 Decided how to allocate the fuses in the new modular fuse box. 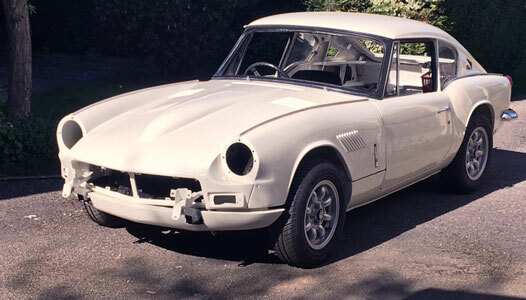 For more information, visit the "Wiring Loom" section of My GT6/Latest Restoration 2 or click here. Also cleaned up the rear window, and tested the heating elements with a test multimeter. Initial dismay, finding that most of the 14 wires are not conducting i.e. 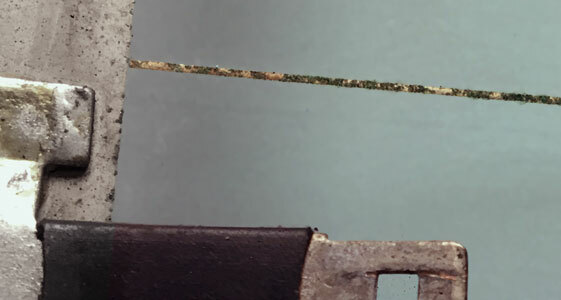 apparantly broken, turned to mild euphoria when I discovered that scraping the corrosion (see below) from the wires showed they were conducting. This screen was brand new in 1981 (it was a Triplex Toughened Sundym Hotline for a Mk3, hence the wires are across instead of up and down, as the original Mk2). 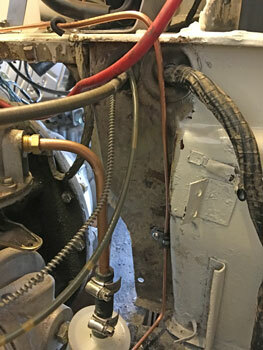 Hopefully, when connecting the connecting strips on each side to the car's wiring loom, the heat generated will make the corrosion flake off (I daren't sand it off which will scratch the glass). Finally worked out a circuit diagram for the headlamps, Sidelights and DRLs (Daytime Running Lights) I will fit in place of the pilot lights in the headlamps, all using relays in a new fusebox! 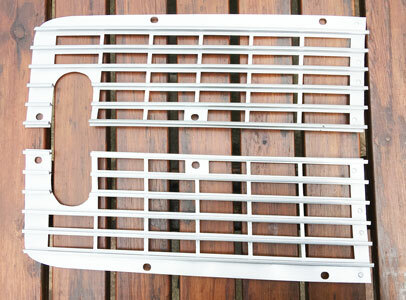 Sprayed and fitted front aluminium grills (as fitted to early Mk2 GT6s). The grills were given to me some time in the early 1980s at a TSSC local meeting. As they are now sought after, I had them soda blasted, and then gave them a few coats of silver car enamel and then clear lacquer. Fitted with M6 stainless button bolts which I think look very good! Assembled the headlamp parts, trying to work out how they went together! Very hot (over 30 degrees yesterday afternoon)! I've worked out how the headlamps go together, after much head scratching. The outer (metal) bowl screws onto the bonnet, though the rubber gasket underneath with 4 self tappers (going into spire nuts FC2804). 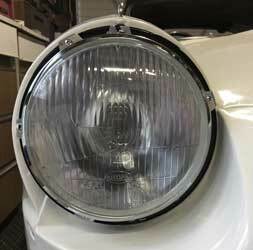 The two adjusters fit into the open slots on the top and left, for both left and right headlamps as below. 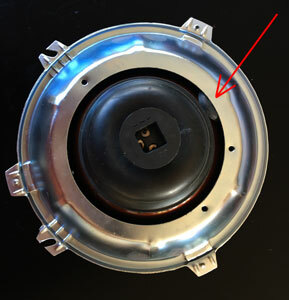 The glass headlamp bowl seats onto the rim unit/inner bowl and is secured by the retaining ring (bottom left in the picture above) with 3 self tappers. However, I have encountered some problems. 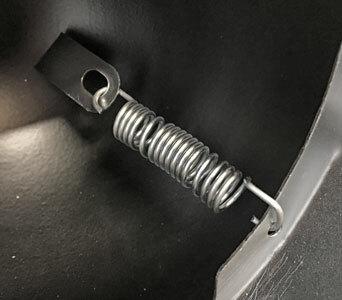 First, my existing headlamp (with pilot light hole, obtained from Rimmers) is a loose fit when secured as above, and more importantly, there is no room inside the inner bowl for the LED DRLs I intended to fit. These are also too long to fit in the front sidelights. 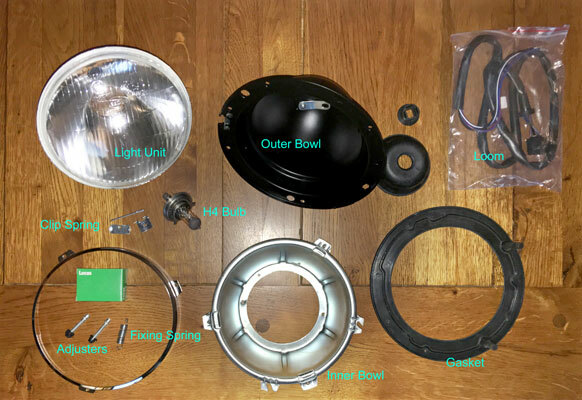 I've been to visit Paddocks, and after a conversation with Paul, I bought a SBC3 Lucas 7" Headlamp Bowl Kit (see below). When I went to fit these I found that they were too large. 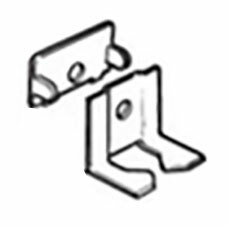 The fixing studs/adjusters which go into a hole in the headlamp part of the bonnet are 7¼" apart, compared to 7" on the car. I queried this with Paul but he did not know of a smaller version which is strange as these are supposed to fit the Spitfire Mklll which is very similar to mine. I've therefore fired off a couple of emails to both Rimmers (who supplied the headlamps) and Auto Electrical Spares who supply lots of headlamp stuff! Finally finished the fixings for the MTA modular fusebox. 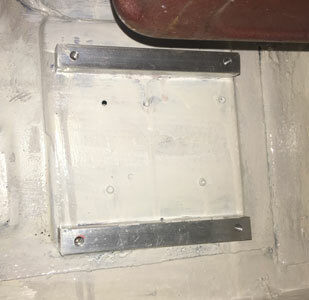 As I didn't want to drill any holes in the car, I made up some aluminium bar 15 x 15 x 125mm to which to screw the fusebox. Screw holes were drilled and tapped for M6 button screws. 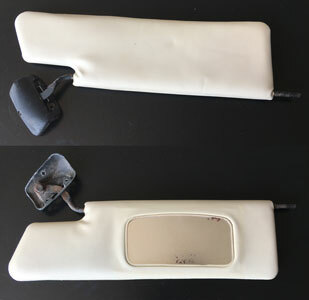 These were glued into the car in the passenger footwell (behind the chassis plate). 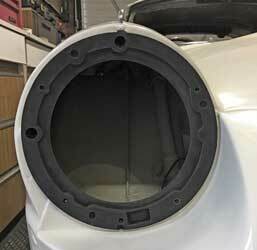 Below are the aluminium bars, glued to the inside of the car (just below the battery box). No work done, as preparations for my 70th Party next Saturday, and looking after Liz who has been very ill with a mystery virus, have taken up all my time. 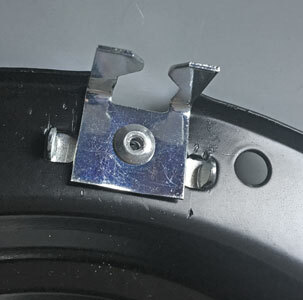 The only thing I've done is obtained a new jack handle, and bought some clips to attach it to the underside of the spare wheel board (both from ebay). 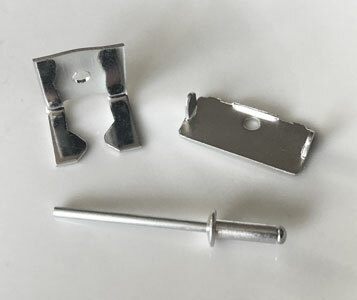 I've also ordered some 2.5mm bolt sets to attach the clips to the board, The look I am aiming for? See below right (from the GT6 handbook). Party day! Around 50 guests arrived to help me to celebrate 70 years on this planet! 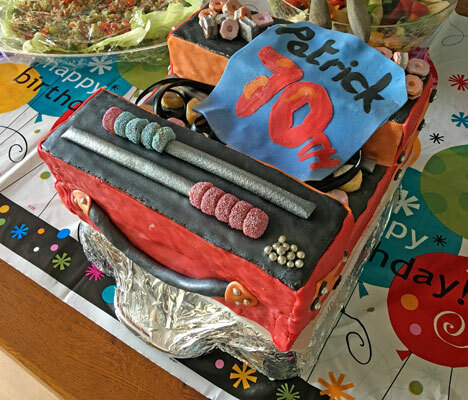 Garry made me another cake, this time in the shape of a toolbox. Below are this, and his 1998 original. Since my last entry not much done, still planning the wiring! My Inguinal Hernia hasn't helped, and Liz has been quite ill with suspected Polymyalgia Rhumatica. What a couple of old codgers we've become! 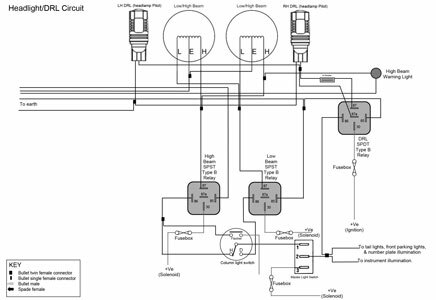 Just finished designing the new wiring looms, drawing them in Drawplus and collating them in one pdf document! 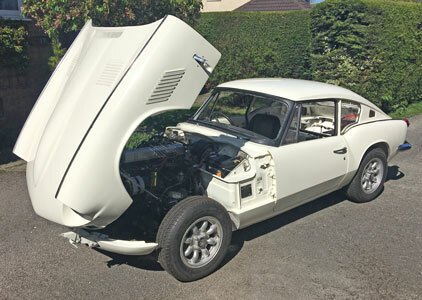 For more details see my My GT6/Restoration2/Wiring Loom. Roughly assembled the headlight to see how I can fit the DRL bulb in the pilot light hole. 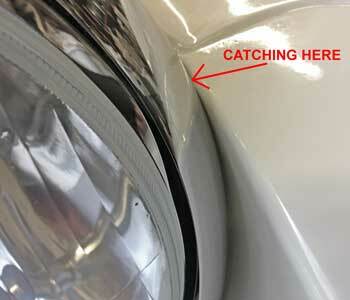 Below the second picture shows how the inner bowl is in the way of the pilot light hole. 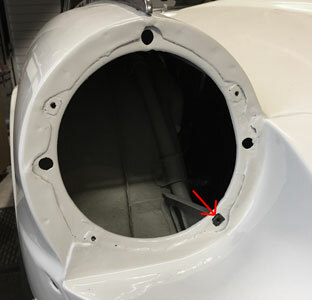 The third picture shows where the inner bowl needs to be relieved so the wiring can reach the pilot light hole (to be used for the DRL). As my hernia was less painful today, I started the GT6 and drove it out of the garage so I could replace it in a better position (it was too close to one side). I've made a video with my new camera, which I have posted to Youtube. To see it click here. The engine sounds magnificent, although at the end it missed a bit (perhaps the fuel is running out, I need to put in another can full). 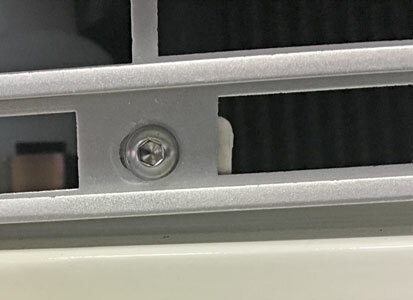 With my Dremel I made the cutout for the wires & connectors to reach the DRL in the pilot hole as last Monday, see below with a terminal inserted (although I won't be using pre-insulated terminals). 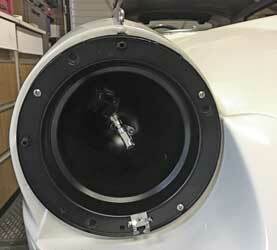 Next picture is the LED DRL bulb in its 'pilot light' holder. It will be very bright! I then started assembling the LH headlamp. 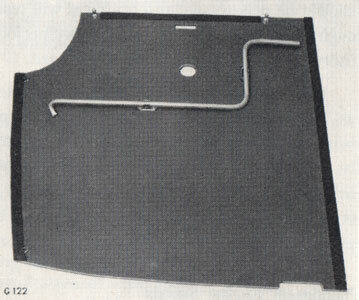 First I inserted a new "Fix Nut - Simmonds SNO Type", see first picture below (this description comes from the Standard-Triumph Hardware Catalogue). 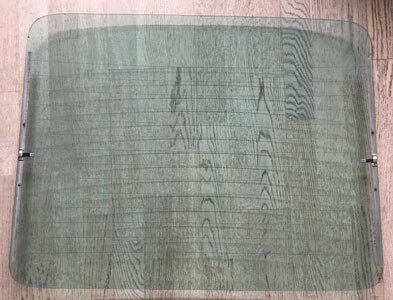 The second picture shows it in situ, the square hole arrowed. . 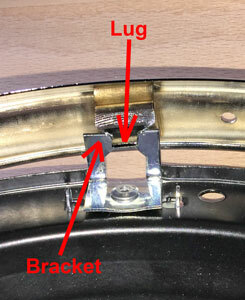 The third picture shows the Headlamp Gasket in position (with the hollow protrusions for the adjusters left and top). 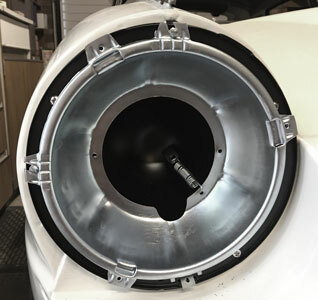 The fourth picture shows the Headlamp Bowl fitted with stainless steel self-tapping screws. The holes for the adjusters need to be top and left as well. 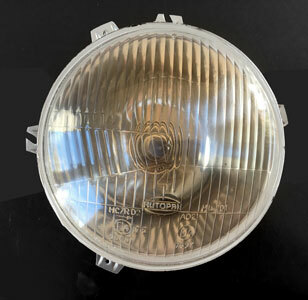 Continued with the LH headlamp. 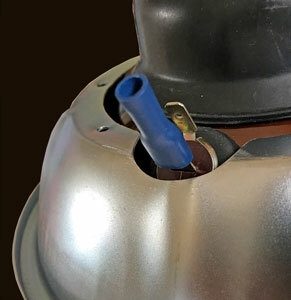 First below, the adjuster plastic "nut" inserted into the headlamp bowl from behind. 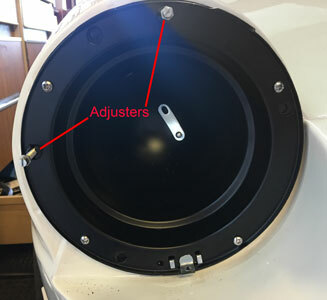 Second, the adjuster itself, screwed into the "nut". Third, the spring from the inner to outer bowl. 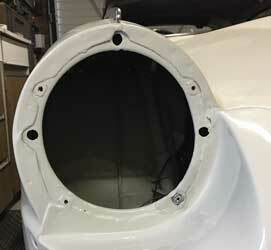 First below the outer fitted to the inner bowl; second the headlamp fitted with its retaining ring. 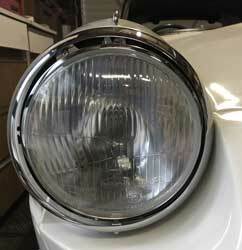 The problem now, is how to fit the chrome headlamp rim, which will need a bit of detective work! 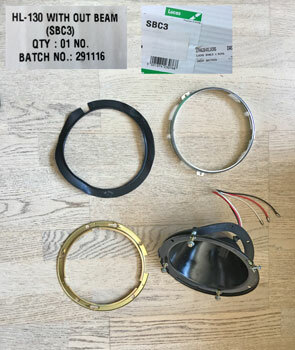 When I bought the headlamp components from Paddocks they included some mysterious metal parts (see below-1) with no instructions as to what to do with them! I couldn't refer to the old ones as they were so rusty I threw them away years ago (without taking photos). 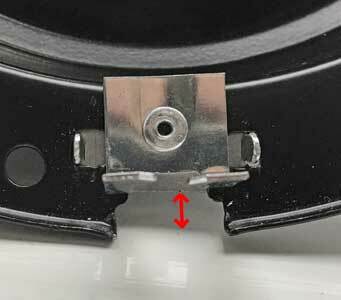 I therefore came to the conclusion that the rim hooked over the two arrowed protrusions at the top of the headlamp bowl (below-2) and was normally secured by a screw at the bottom (hence the hole at the bottom of the rim and the bracket at the bottom of the bowl see below-3). 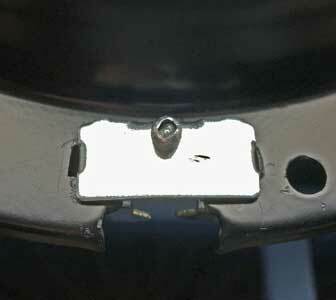 The only problem is that because the headlamps are in a recess on the GT6/Spitfire there is no way to access a screw. 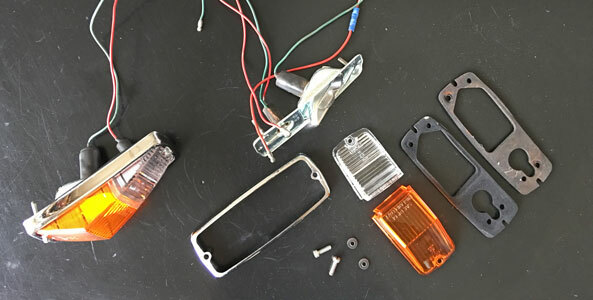 This is where the purpose of these metal parts became clear! 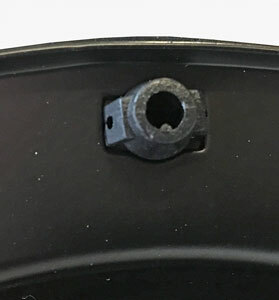 Instead of a screw the bracket at the bottom of the bowl needs to be replaced by the new metal parts which become a bracket onto which a lug at the bottom of the rim clips. 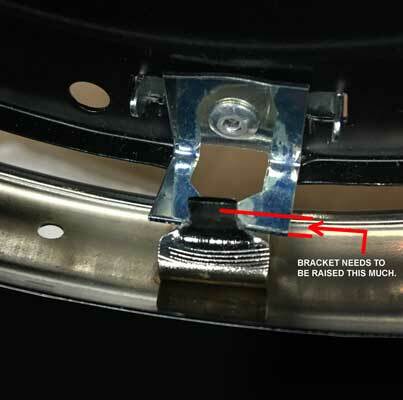 The only problem with this is that the new bracket (see above) is in the wrong position, it needs to be higher up (see below). 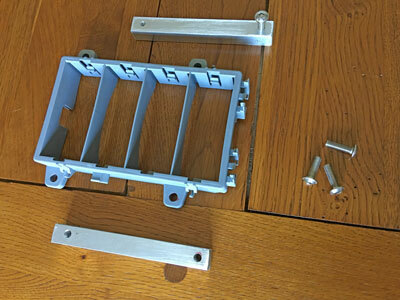 I tried bending the bracket but it is still not quite right, the bracket needs to be mounted higher up. 3. 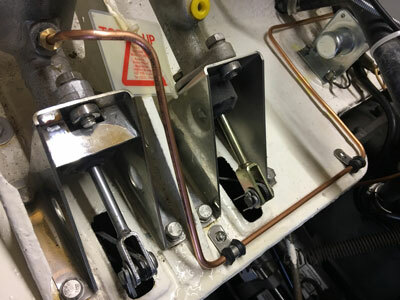 One of the 2 mini-blade fuse modules with (top to bottom) The yellow secondary locking bars (slid into place to prevent the terminals being pulled out); The module; Busbar terminals (consisting of a row of individual terminals linked on a strip); Fuse terminals; and a couple of fuses. 4. 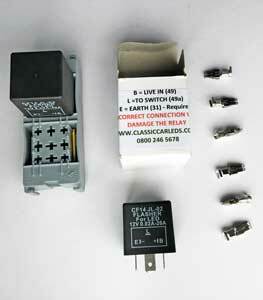 (from left to right) Module for 2 mini-relays; an electronic indicator/hazard "relay" with OE clicking sound; and non-insulated crimp terminals that accepts 6.3mm wide pins. 5. The module for 6 micro-relays. 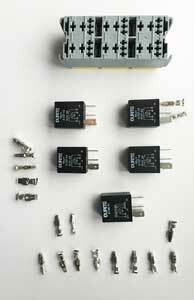 The 4 relays underneath are 4-pin and the additional one underneath these is a 5-pin. 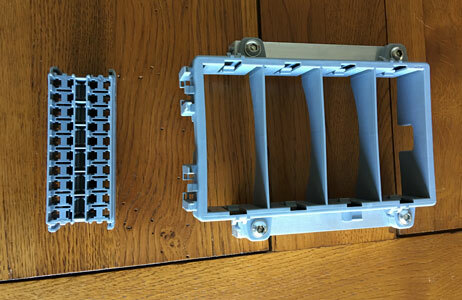 Various terminals can be seen, at the bottom small ones for 4.8mm wide relay pins and on the left larger ones for 6.3mm relay pins. For some reason I've only got 5 of the larger ones when there are 2 per relay - I need 5 more! 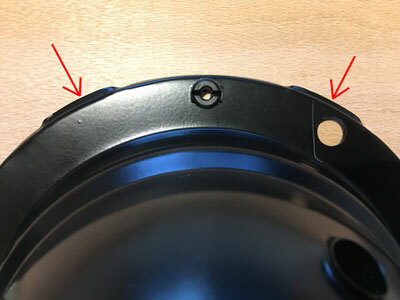 In the end I removed the bracket by drilling out the pop rivet, reversed the rear part drilled a hole through the rear part and the bowl itself and refitted the front part, with the clip, now in a raised position. The red arrow shows the amount the bracket was raised. Below we can see that it should now fit i.e. 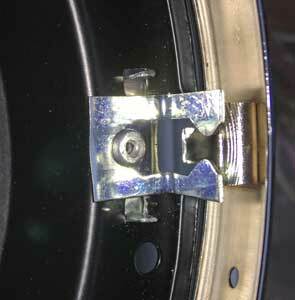 the headlamp rim should attach onto the top 'lugs' and clip at the bottom (see below). 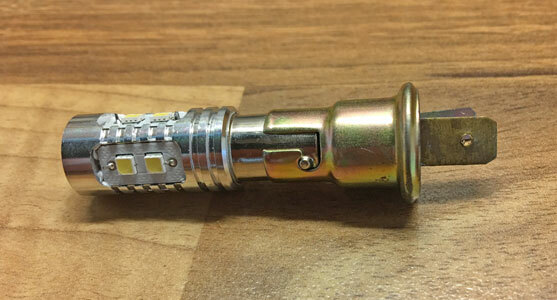 Crimped female spade connectors onto the DRL LED bulb with tool PR4. 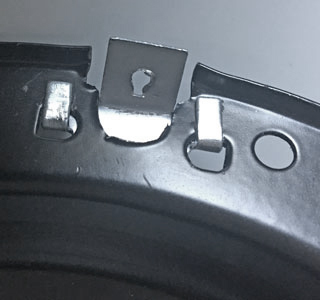 The Fix Nut - Simmonds SNO Type (see September 22nd) was too small so I researched these more and found that the part number on Canleys website was FC2804. 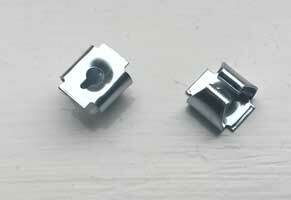 Paddocks listed these as 'headlamp bowl to body mounting spire clips for theTriumph Stag! I therefore obtained some, see below. Finally assembled the left headlight, to come against another problem! 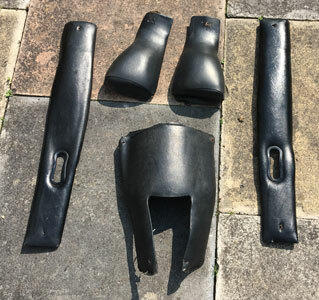 All the parts went together reasonably well (see below) but when I tried to fit the chrome rim, it wouldn't go on, as the whole assembly was too close to the front bonnet headlamp recess! 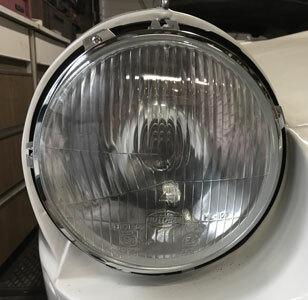 Incidentally the 4th picture below shows the LED DRL bulb, before insertion into the pilot hole of the headlight unit. 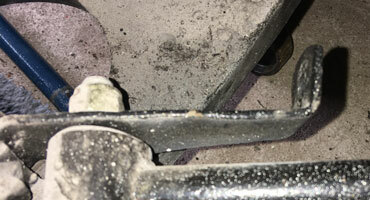 A closeup of the problem. The solution? 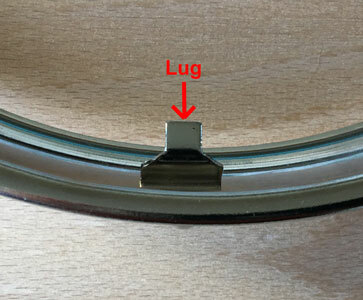 I'm not sure at the moment, first I'll loosen the screws holding the inner bowl and try to move it to the left. Recovering from hernia operation last Friday! 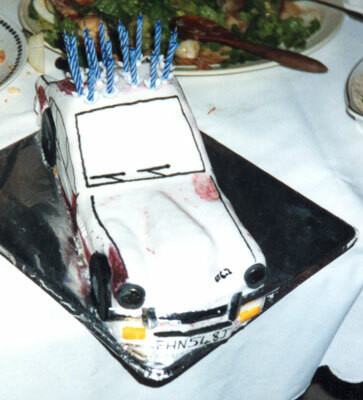 I hope to resume 'car' activities in due course! 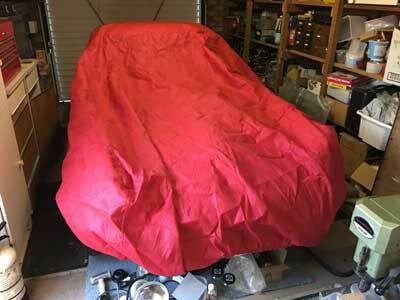 Now fully recovered, but it's too cold to work in the garage! 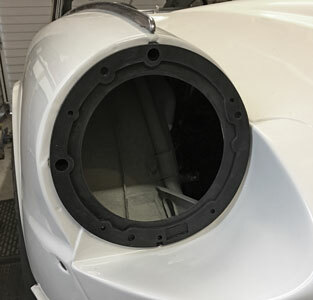 The cover's over the car, and just under the front of the car can be seen the o/s headlamp bits - getting these to fit is my first job of 2019, when I must get the car back on the road! The battery's not on charge. I put it on charge before my operation but when I went to get the battery charger to lend to my son, Jason, to charge his SEAT (off the road after accident) it had been unplugged (by my wife?). When I pick him up at Christmas I must get it back as I usually leave it permanently on charge over the winter months.